Dessert Darling Organic Gummy Bears by Yummy Earth, DD Approved! | Dessert Darling ). When I was a kid I ate my share of sugary cereals and Candy Candy Candy everyday! Yes, everyday I would go to am-pm after school to buy a treat!! And then go home and eat Lucky Charms! And while it wasn’t “good” for me then, it wasn’t the same grade of poison that today’s candy is with its High Fructose Corn Syrup made from corn seeds that were cross-bread with insecticides by Monsanto’s scientists. Bleh! I wonder how I’ll feel someday, letting my future kids go trick-or-treating when I know how detrimental today’s candy is to their health. It really bums me out as Halloween is a holiday that is near and dear to a DD’s heart! In this vein I’ve kept my eyes peeled for candy that children can have now that won’t alarm their systems with a barrage of chemicals, artificial colors, unpronounceable substances, and GMOs. 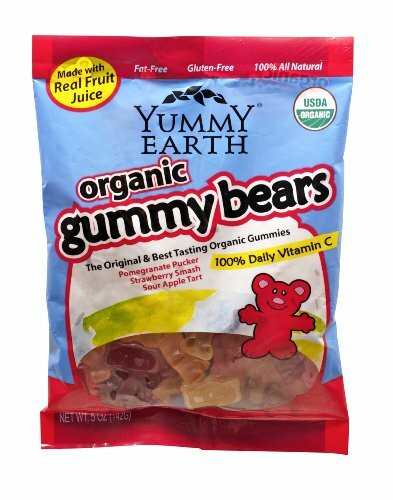 I came across these Organic, Gluten Free Gummy Bears by Yummy Earth at Whole Foods and they are totally delicious! They even have that perfect, tough consistency that a Haribo Gold-Bear has (my childhood favorite). Sure they don’t come in the same technicolor rainbow as other candies, but they also don’t have those toxic colors that contribute to ADHD (see here). I’m really glad that I found Yummy Earth. They carry other organic candies that I hear are phenominal… particularliy the lolipops. Yummy Earth is DD Approved with 5 Shiny Cherries! Pps: Click here to ask the FDA to label foods with GMOs so that you don’t have to shop in the dark. I read your blog every once in a while and was interested about your comment on GMO’s. Found this article recently and thought you may want to read it. Just something interesting to think about.